Rampur (Uttar Pradesh) : The Uttar Pradesh Police on Tuesday arrested four more accused in the shocking Rampur molestation case, taking the number of nabbed perpetrators to nine. Out of the four arrested, one has been identified as a 16-year-old minor, named Rahees. The other three have been identified as Fazil, Bhoora, Qasim. A massive hunt is underway to nab the remaining five absconding culprits. 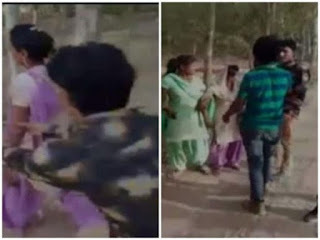 Reacting sharply to the case, Uttar Pradesh ADG Law and Order Aditya Mishra yesterday dubbed the incident as 'sad', while saying that the police would ensure that such misconduct is not repeated in future. "This is very serious and sad incident. We will try that this kind of incident should not get repeated in future," Mishra told. The state police successfully arrested four prime accused in the molestation case till yesterday. While three men were arrested on Sunday night, the fourth was nabbed yesterday.